Tag Archives for " Ekaterina Walter "
2	Will Facebook Remain Relevant? With over a billion users, a place in the everyday life of over 60% of Internet users and a track record as one of the fastest growing companies in history, the title of this post may seem odd. But, like every white-hot phenomenon, Facebook must continue to evolve to remain relevant in the lives of those that built it. There are already signs that people are growing weary of the behavior the social network fostered. The Facebook generation is growing up and the next wave of high school and college age folks don’t think it’s all that cool. Vine and Instagram seem so much hipper right now. So, is the future of Facebook a sure one? My guest for today’s episode of the Duct Tape Podcast thinks Facebook has something that other companies lack – a leader with a long-term vision. 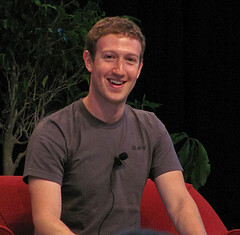 In Think Like Zuck: The Five Business Secrets of Facebook’s Improbably Brilliant CEO Mark Zuckerberg , social media innovator at Intel, Ekaterina Walter outlines how 19-year-old Mark Zuckerberg revolutionized the Internet and why he may continue to do so. Walter contends that Zuckerberg possesses the traits that have driven other leaders such as Bill Gates, Steve Jobs, and Jeff Bezos, to create innovation and breakthroughs over and over again. Most notably she stresses Zuckerberg’s uncanny long view. In the face of mounting pressures to produce profit for shareholders, a place on the world leadership stage and constant criticism for decisions on innovation and privacy, Zuckerberg has remained passionate about the long-term path for Facebook and that, Walters suggests, is why she would not bet against Facebook. Throughout Think Like Zuck Walters illustrates the nature of five traits that are shared by brilliant leaders and signal the healthy traits of any leader. Passion — Keep your energy and commitment fully charged by pursuing something you believe in. It’s funny how many recent works, including my last book, The Commitment Engine, have explored the relevancy of things like passion and purpose in business. There is little denying the impact these traits bring to the story and culture of a business and, love the idea or hate it, Mark Zuckerberg is a shining example of what it takes.